Nylon wallets are always my top choice when going to the gym, running, or joining other outdoor activities because they’re good at water resistance and low maintenance, unlike the leather or canvas wallets. They tend to be affected by sweat and moisture. If you’ve heard somebody complained for the less durability of nylon wallets, trust me, it’s just them not finding out the right materials yet. A tip for newbies to consider their very first nylon wallet is looking for either of these two keywords “rip-stop nylon” or “1000D nylon”. 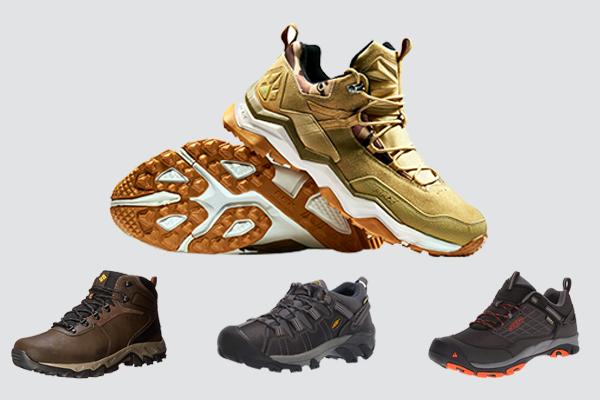 They are well-known for the most durable kinds of nylon to not only last for longer time, but also be very lightweight. There’s just one minor drawback of nylon wallets is easy to have bad smell. But don’t worry, I’ll share you one super-easy tip to avoid that in the end of this article. And now, join me and take a look at the best nylon wallets out there on the market. The No.1 of this collection is Chums. I’ve been sticking with this affordable brand for 2 years. And up to now, my collection includes around 7 out of 13 colorways of the Surfshort Wallet Line because of their cool colorways. I also tried the latest versions of Chums, they are attractive, but in comparison of quality and feeling touch, this one is still the best. The Black/Gray option is my pick for you as a versatile piece with lowest maintenance! They are easy to clean and don’t show off stains or dirt as much as the bright colors. Among the nylon wallets that I’ve tried, in terms of price range, this is a mid-tier. But because of its superb durable rip-stop nylon materials and YKK zipper, in long term, this turns out to be a great investment. I’m here to prove that – my first Chums Surfshort Wallet, which is a blue/orange, it’s been along with me for two years and now, there’re just some small wears at the corners. Insane! There’s nearly nothing to talk about its construction because as you can see, it’s super minimal with 1 zippered pocket and 1 ID window. However, I usually take advantage of the ID window for coins or small changes rather than my identification card thanks to its closure design. 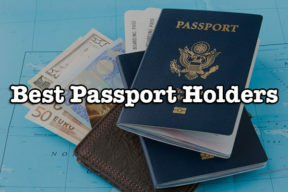 Though small, it can accommodate roughly 7-10 folded bills and 1-3 cards. That excesses my expectation for a to-go wallet for the gym, running, playing sports, or going out for a meal. Besides, such that compact measurements turn out to be a big bonus as you can attach it to your car keys, backpacks, lanyard or car mount. In generally, there’re different ways to use it, just up to you. A trifold nylon wallet is what you’re all about? Consider this olive multifunctional Timberland model. 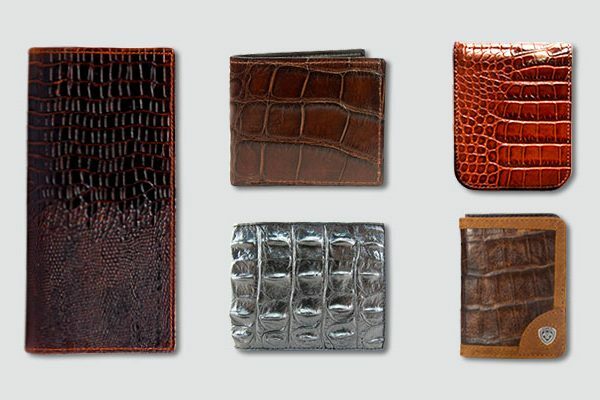 It’s like “the wallet of the year” that can suit all age ranges, from kids, boys, to adult men. My guess is, its low-key outlook is the main point. At first, I thought it was a canvas wallet, but actually, this is 100% nylon design – very lightweight, wear-bearable and easy to clean. Not only the material, its dyed color is very durable, too. This olive nylon wallet has been with me for 1 year and a half but now, after a lot of hand washes, it just gets faded a little bit. But what impressed me the most is its 13 card slots. Wow! It’s more about a casual wallet to accommodate all of your daily essentials because aside from such numbers of slot, you also get 1 full-length bill compartment and 1 clear ID window. And with such generous capacity, this buddy can store more 10-12 straight bills, and photos/IDs/driver license. Everything is surely neat and easy to access. However, on top of that, it still keeps an amazing slim silhouette to stay neatly in your pocket. Consider this if you want a wallet that’s best of both worlds. For more functional, cool Velcro wallets for men, look at here. Once being a victim of losing money just because my old bifold wallet can’t shut closely enough, I start using the zip-around designs. Among them, this is the best nylon wallets that anybody with the same interest as me should try. Its price is a bit higher than the two above, though. For the quality, I find it’s a well-worth investment since every single detail, from the nylon microfiber, the zipper, the rubbery coating to the brand logo, is rather durable. Only after a year of abusing, its black color has been faded a little bit. But that’s so satisfying for me! No remorse for the interior! 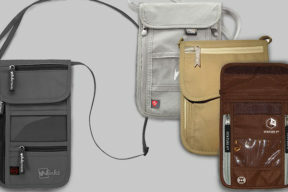 4 Card slots, 1 clear ID window, and 2 long compartments for bills + receipts. It’s basic but for the maximum capacity, the number of cards can be up to 18. You didn’t hear it wrong! Nylon is stretchy and such that load is completely possible in this design. On top of that, is the striking lightness and thinness. To help you easily imagine how lightweight it is, I’ll tell you my story. Before changing to this, I had been sticking with my old leather wallet for a while, which led to some weird moments when carrying it along as compared to the leather, this nylon wallet is even 7 times thinner and lighter than. 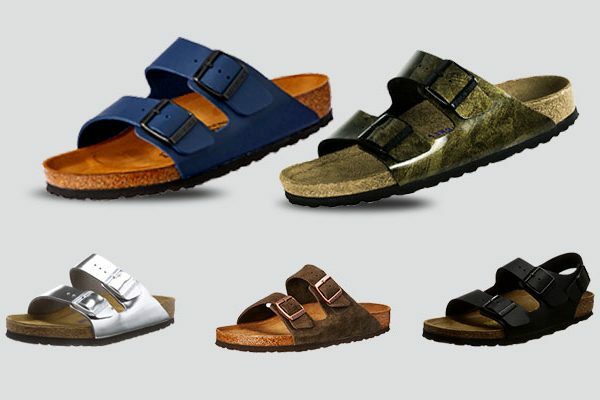 Finally, two color options for you to choose from: Black and Brown. 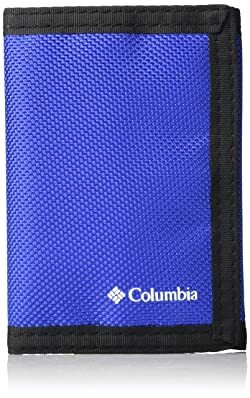 This Velcro wallet from Columbia is my next recommendation for trifold-wallet men. It’s the same closure as the zippered design, but way more comfortable to stay in your back pocket. Two biggest highlights of this wallet make it become one of my favorite tactical wallets: low maintenance and extreme durability. During my 7-day camping trip around the Hill Country of Texas, this got dirty for nearly 5 times as I accidentally dropped it into muds or water. Amazingly, just by hand wash with water without soap, it was super easy to clean and also dried out quickly. Just leave it overnight or under sunlight within 2-3 hour then, the tactical nylon wallet was ready to use again. Besides, during this trip, I took advantage it as storage place for my EDCs. Though that with such super cheap price, I could rebuy it easily afterwards if the wallet was damage as these EDCs were actually very heavy. But turns out it’s better than my expectation. No tears. No deform. Amazing! You can use it as a casual wallet because of their moderate capacity and streamline interior: 5 Card slots, some cash pockets and 1 ID window. Finally, are 10 color options to choose from. 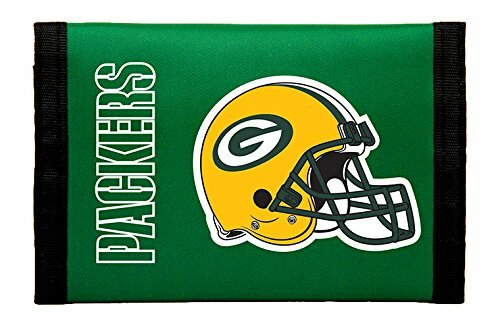 If you’re a solid fan of Green Bay Packers like me, you might feel yourself smitten in this cool, well-made trifold nylon wallet. Don’t worry, it’s legally licensed to buy. And what I would like emphasize here is its durable, nice printing on the outside. While other printed nylon wallets of mine spilled off only after a couple of months use, this one isn’t the one. Under my abusing, it still stays gorgeous and cool. The same as its interior – very sturdy and long-lasting with tight stitching, strong seam. Figured as a trifold wallet, its capacity is obviously spacious and well-organized with multiple card slots, 1 bill compartment and 1 ID window. On top of that, is a compact and moderately flat silhouette to stay in your back pocket with less bulk as other trifolds. If you concern about the way it shuts, this one is like the Columbia with Velcro strap attached on the side to keep the wallet closure when not in use. No hardware at all to keep you worry free of rusting or breakage. And finally, is the price. Guys, it’s super cheap – only less than 7 bucks. If the NFL trifold wallet above gives you so less options in team names, consider this one from The Northwest Company. Not only various in team names, they also offer a lot of color choices so I’m sure that you can at least pick one favorite to show off your pride. 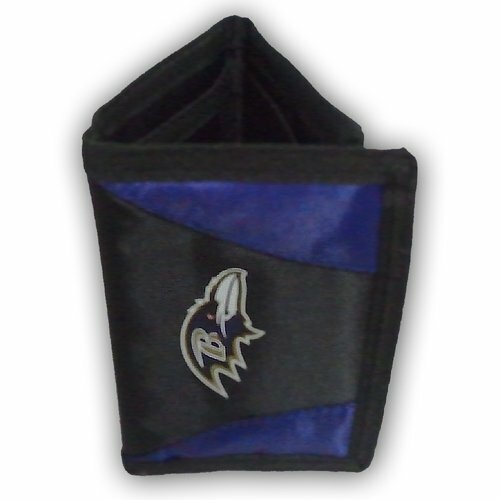 Also, all NFL wallets from this brand are officially licensed so, you can buy them with more confidence. Speaking of its outlook as well as printing quality, I myself consider it’s more about minimalism with just one printed team logo on the frontside. But the quality is even better than the previous model. They are thick but smooth and high-quality. Up to now, it’s been stuck with me for more than 1 year and there’s no chip off yet. The same with the nylon material, it’s 420D kind, featuring thick texture with nice roughness and durability. Along with that, is the double stitching to make me sure about its longer lasting ability. Now, going inside, you can see that its interior is much similar to the previous NFL wallet with a lot of card slots, slips, as well as 1 ID window and 1 bill full-length compartment. For such more decent performance, its price is obviously twice costlier than its cousin. To me, it’s so much well-worth. I would pay double! 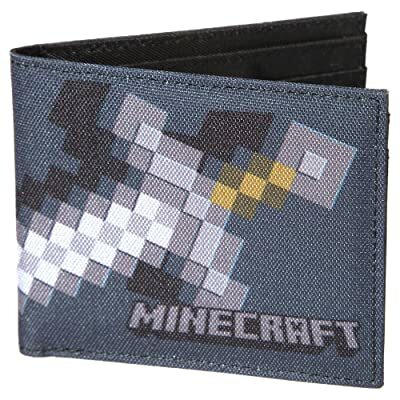 Like a memory ticket back to childhood, this JINX wallet with its minimal but eye-catching sword design remind me to the legendary Minecraft video game. The solid addictive entertaining activity that I nearly spent my childhood on. And if authorization is your biggest concern, rest assured, this one is officially licensed by Minecraft company. And the printing itself is redesigned by JINX to blow a new wind – more attractive, more fashionable. But my reasons to recommend you choosing this wallet don’t just lie on its outlook, but also quality and function. 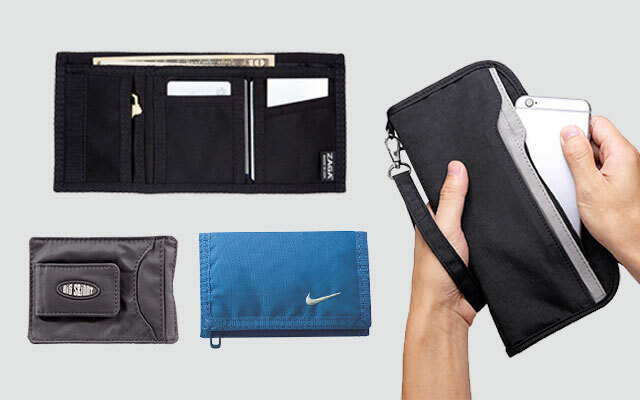 The whole wallet is crafted from 100% durable polyester nylon material. Along with that, are 4 card slots, 1 ID window, 2 slips, and 1 long bill compartment. So, in general, this buddy can accommodate easily and comfortably 7-9 cards and 10-12 straight paper bills. That’s so much in capacity for a bifold wallet, don’t you think? But what amazes me the most is after all, it still keeps an amazingly slim silhouette, especially when closed off, you can easily toss it in any pockets, both the frontside and the backside. That’s a precious thing to me because I don’t frequently place my wallet in the back pocket due to the fear of pick pocketer. For sporty guys who are in need of a slim trifold design with durable, wear-resistant nylon and roomy capacity, this minimal but stylish Nike wallet might be what you’re looking for. But I want to make clear of its material, this wallet is not purely made of 100% nylon, but exactly a combination between polyester (body) and nylon (lining). However, that doesn’t influence much on its whole performance, if not mentioning to its even lighter and more flexible. Even there is an extra zippered pocket inside this wallet, you don’t feel any bulk as when with other trifolds. That’s, to me, the biggest bonus. 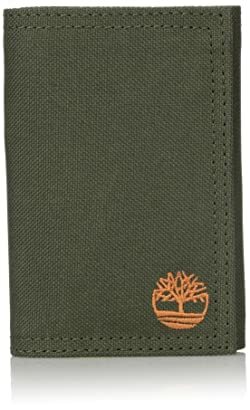 Featured with 6 card slots, 2 slips and 1 bill compartment, it’s just enough for my essentials for gym, camping, hiking, or simply, daily use. And speaking of the additional zippered pocket on the outside, I find it super convenient for coins, keys, and other regular stuff of mine. Lastly, is the embroidered swoosh trademark on the frontside, every single stitching is very delicate and detail. 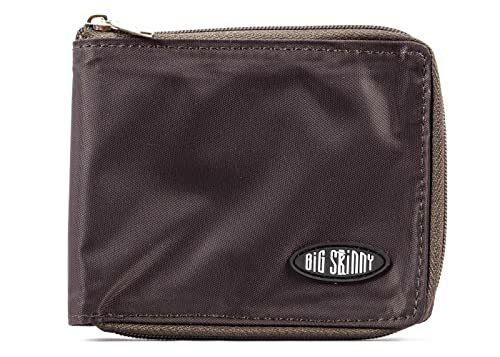 Along with that, is the sharp design, double stitching, durability, and high sophistication in every seam, they are enough to prove this is an authorized wallet. 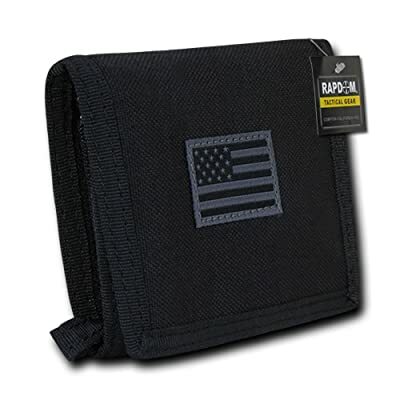 RAPDOM is one of reliable brands specialized in military stuff, such as bags, wallets, hats, and gloves. So, when it comes to choosing a high-quality product involving to military with exquisite manufacturing process, and high function, you can consider this. Speaking of this kind of wallet, actually, it’s a favorite pick of policemen or veterans because firstly, it’s crafted from the most durable material – 1000D 6.6 cordura nylon and plus, very lightweight in person to carry around without bulk. Secondly, is its superbly streamline interior with huge capacity to allow you to carry a lot of essentials, such as coins, cards, cash, receipts, keys, and so on. The most impressive thing, in terms of its construction, is the 18 card slots. Holly crap! Not saying that there’s an extra zippered pocket and 1 ID window. The whole wallet is shut by a Velcro strap and when closed, it’s measured only by 4.75″ x 3.5″ – really compact to be a front pocket wallet. Based on such wonderful benefits, this wallet sooner gains more love from many people despite its lack of fashion aspect. 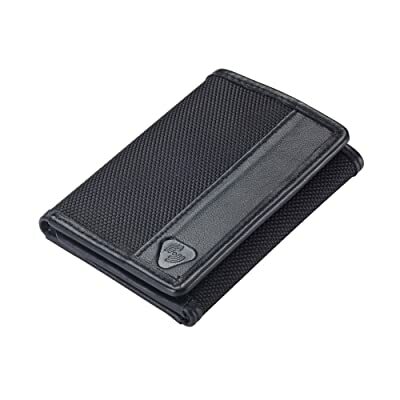 If you’re looking for an EDC wallet to satisfy your demand of huge load with great arrangement and durability, pick it. The very first nylon wallet in this collection that’s equipped with RFID Blocking Technology for those whose demand more in private information protection. This extra feature will help you block any signals in 13.56 MHz frequency or higher as well as keep high-tech thieves at bay. 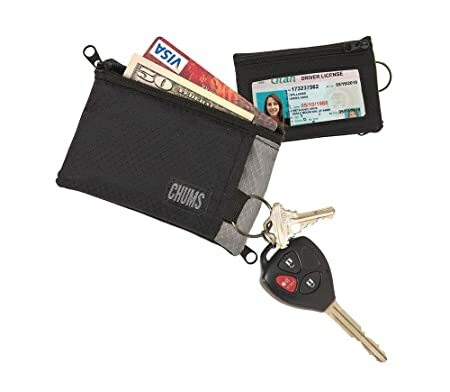 Unlike other RFID wallets, this one is much lighter and more flexible due to its high-quality, weight-reduced ballistic nylon material. But to retain a luxurious and vintage look, the trim and interior of this wallet is made of soft lambskin leather. 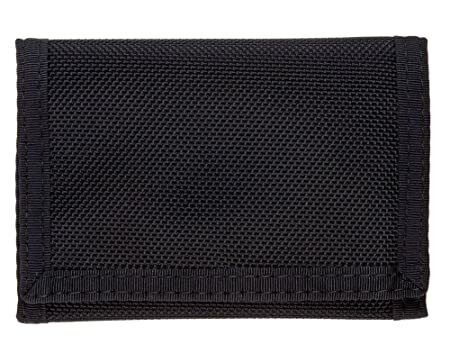 Plus, this wallet comes in full-black color to bring a very cool, masculine and minimal look. 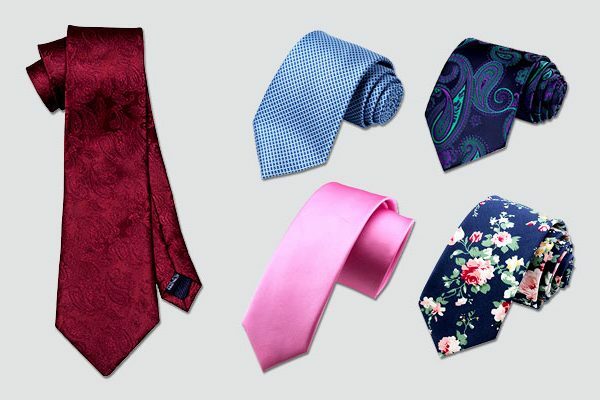 From that point, it’s even more versatile to be either a casual wallet or a formal pick to any parties, events or appointments. But the price can’t be more affordable. In brief, this is a really good investment. Next up is a trifold wallet from ZAGA that I bet you will extremely fall for because of this feature – Made in USA. Pick it and you will have no worry about trashy quality products, shipping cost or delivery time. For any order within USA, they offer two-day free shipping. Wow, it’s really fast and affordable, at least in my standard. But the quality? From my experience, get no remorse on this purchase yet! 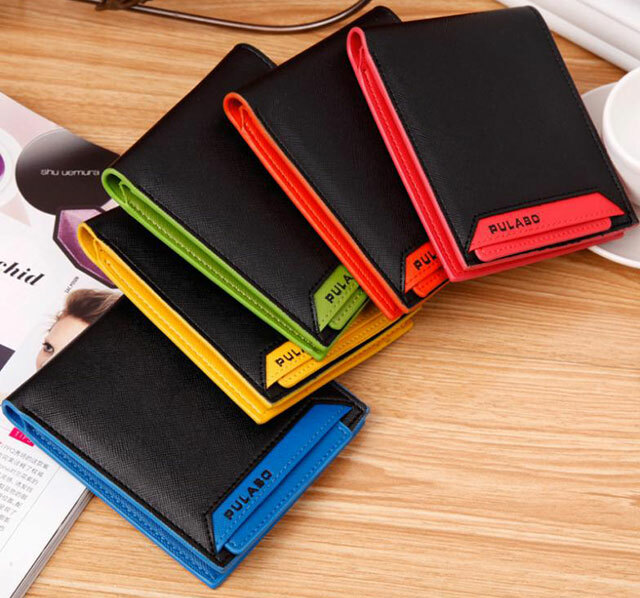 In terms of its outlook, I think it’s a perfect choice for anyone who are looking for an utterly simple design of the wallet because there’s no excess detail in this model (including the brand name or brand logo). It’s in reality a full-black design. The same with its interior, aside from a small brand logo tag, there’s nothing else. But contrast to that, is a rich construction with lots of card slots, slips, and bill compartment. In totally, you can put in 7-10 cards and 10-15 bills without a burden. All in all, this is a basic choice for those who only focus on function of a wallet without much care on aesthetic spectrum. 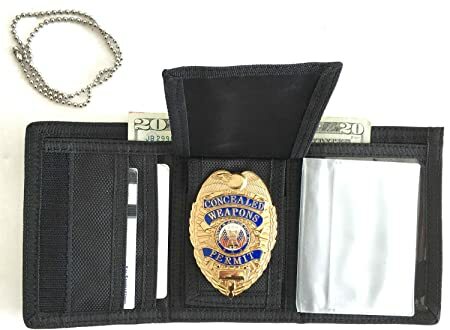 If you’re looking for a badge nylon wallet, here’s my best suggestion. 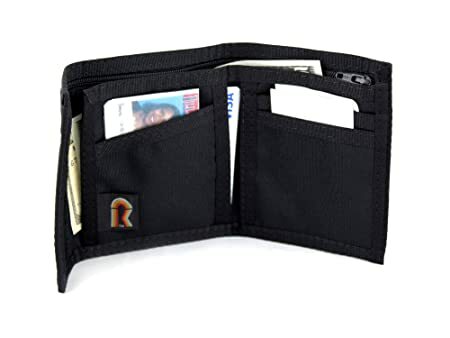 Like the previous trifold wallet, this one features a full-black outlook with plain space on the frontside where you can attach your badge on or stickers due to preference. Take note that, badge won’t be included in this set. In terms of interior, I find this one is much more functional and spacious than its cousin. Feature 3 card slots, 1 slip, 1 bill compartment but moreover, there are a lot of clear ID window as extra card slots or photo holders due to your need. But here’s where the real fun begins – its durability. Guess it, how long can this wallet last? 3 years, or 6 years? Nope! It’s at least 1 decade. I know to this wallet from my father and up to now, it’s been nearly 15 years he’s sticking with it. Amazing, right? For the price, it’s unbeatable! 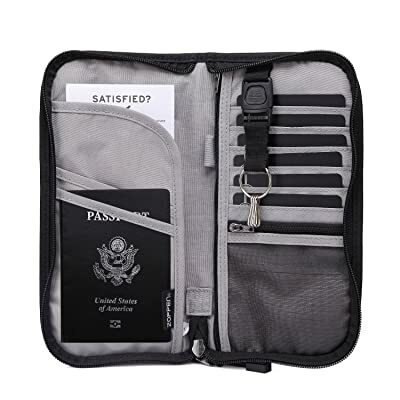 This Zoppen organizer will be a perfect choice for traveler. There’s always space for your essentials during a trip, from passport, flight ticket, boarding pass, to card slots, paper currencies, checkbook, smartphone, coins, and keys. Not saying that, you can put in 2 passports in this model and the key holders can be removable you’re not in need of them. 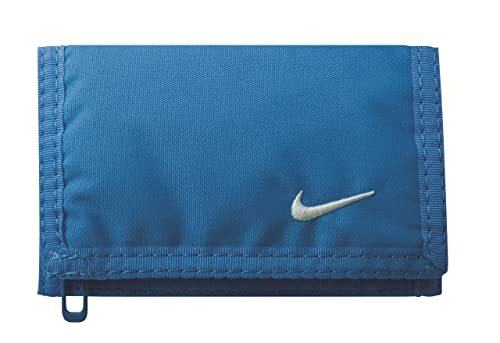 The whole wallet is closed by a sturdy, smooth zipper to keep your essentials in place without falling off accidentally. Plus, there’s a built-in RFID Shield to protect them from unauthorized scan within 13.56 MHz Frequency. If you’re worrying about its durability because anyway, there’re a lot of things stuffing into it (I understand that), but just feel ease in mind because this Zoppen nylon wallet is crafted from the highest density material with great waterproof and stone wash ability. Plus, it’s already proved by me! Finally, you’ve totally 10 color options to choose from. What gives! 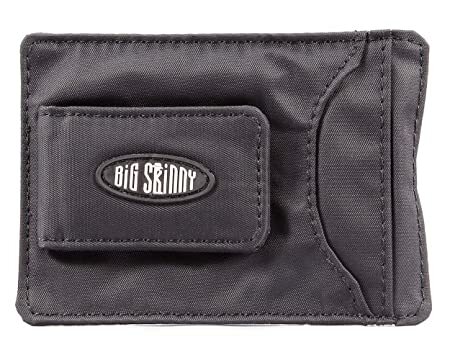 Big Skinny surprises me because of this money clip slim wallet. Nylon material and magnetic strap – is it possible? You know it, nylon is a thin, lightweight and flexible material that’s usually known as hard to keep its shape under a heavy attached thing, like a magnet in this case. But somehow it turns out to be solid, hard and sturdy to hold up well that even if accommodating nearly 10 folded bills, it and its magnetic strap are still fine. No cash falling off unwantedly. Amazing! Along with this powerful strap, you’ve got 3 other card slots, and 1 ID window. But don’t underestimate its capacity just because of its minimal arrangement. Maximumly, this can fit up to 12 plastic cards without tears, wears or bulk. On the contrary, it still maintains a strikingly slim figure with only 4-1/8 x 3 inches. If you are curious about its maintenance requirement, it’s very low because of the durable nylon microfiber. When getting dirty, all you need to do is tossing it into a washing machine. Plus, it can dry out within 30-45 minutes to use afterwards. Great! 15. Rainbow of California Original Bifold Nylon Wallet. Made in The USA. Another USA-made nylon wallet for those who have already lost their trust on those Chinese junks. This one is from Rainbow of California – a company specialized in wallets with huge capacity and neat arrangement. Their products don’t tend to focus on aesthetics or fashion trends, but more about function and practicality. That’s why they are mostly preferred by travelers, hikers, campers, and other people who are in love with outdoor activities with high demand of a spacious but compact wallet to keep their stuff. The original bifold wallet is in black, sizing 3 7/8” x 4 7/8” which is a perfect measurement for any pockets. Besides, is the 600D nylon Cordura material that you can rest assured of a durable, long-lasting and wear-resistant wallet to serve you for years. Going inside, there’re 3 card slots, 2 slips and 1 bill compartment. If your concern is about how it’s closed, it’s exactly a Velcro strap attached on the side. It’s durable, easy to use and particularly, you don’t need to worry about rust after a wash. Very highly recommended. Mix dish soap and water into a homemade cleaning solution. For a few small stains, consult this formula: 1 ounce of dish soap + 1 ounce of water. Remember not to use hot water when making this solution because under heat, stains will be set and harder to remove. Now, use an old toothbrush, dip it into the liquid and slightly scrub the wallet. Move it in circular motion and then, wipe out with a wet cloth. Repeat this procedure until the stains are faded out utterly. Wait until the nylon wallet is dried out utterly and toss it into your washing machine, use cold water setting, mild detergent and wash it in regular cycle to avoid deforming or breaking it. Then, air dry the wallet. Now, how about the oil-based stains? First thing first, use clean, dry tissue and dab on the oiled stains to absorb all excess liquid. Next cover them with talcum powder and let it sit for about 1 or 2 minutes. Then, scrub it with a toothbrush and repeat this procedure until they are gone. That’s all for this quick guide, is it easy? Speaking of the most versatile, functional and durable wallets, nylon is on top of the line, especially the 1000D – it’s like the king in nylon world. However, you also need to accept the fact that these nylon wallets usually come up with Velcro strap or zipper for completely shutting. Plus, there outlook isn’t as luxurious or stylish as other materials. 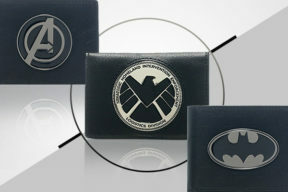 But overall, for the price and quality, there’s no reason to deny such amazing wallets, don’t you think? I hope that with my suggestions picked and analyzed from my own experience, you have already picked out at least one favorite from this list. Happy purchase! How to make a choice of the Feng Shui wallet?